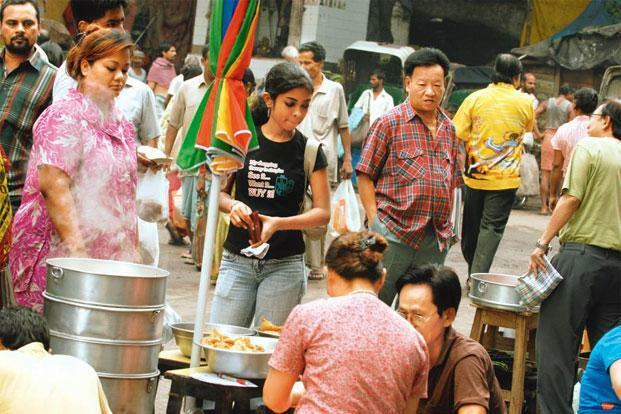 Kolkata, April 11 (www.kolkatachinatown.com): The Chinese in India are a small group of people – very small when compared to the population of India – but this tiny population has touched India in two important places – in their stomachs and in the faces of their women. “Chinese chow” – popular term for Chinese fried noodles vie for place among the all-popular bhelpuri walas and today, few eating places – big or small – dare exist unless it also serves “Chinese food”. Then, beauty parlours, once the sole expertise of Chinese women, now dot almost lane and street in Indian cities and towns. Credit goes to the Chinese community for having helped launch the faces of millions of Indian women. Without even themselves knowing, the Chinese in India has over the years become a part and parcel of the Indian landscape. Their numbers have always been small but now they are tiny, and every day sees the Chinese community in India getting even smaller. It is said that days are not far when it may disappear altogether as a community. But the fact that a community existed for 220 years and has given to India as much as it has got from it cannot be wiped out. Victoria Memorial (or VM as we know it), Metro railway and New Market are closer home than the Great Wall of China or Beijing or Tienanman Square. Puckas, jhaal muri, biryani and kababs seems most times more exciting than steamed fish, chicken soup or stir-fried vegetables. Jyoti Basu, Atal Behari Vajpayee and Mamta Bannerjee are definitely more well-known than Zhou Zemin and Li Peng (heard of them?). Yet, our hearts blow up with pride when China wins medals at the Olympics, goose-pimples come up hearing the Chinese national anthem, the modern good-looking China that we see in magazines and pictures makes us feel great. What then are we? Indian or Chinese? Some time or the other each one of us must have wondered how we came here to be in India and what brought us here… What would life be like if we had not come here to India? When and what was it that made our forefathers come here? This much we know that sometime ago our grandfather (or was it his father before that?) had come here to India and somehow over the years, he stayed back. Our grandmother’s tale was somewhat the same. Then came our parents and then us. We, the new and younger generation of Chinese living here in Calcutta are mostly the third and even fourth generation Chinese. There are Chinese scattered and settled in other parts of India too but most of them can trace their roots to Calcutta and this is hence, Calcutta can be called the source of the fountain of Chinese population in India.